Boston Handmade: Inspiration... Where Do You Get Yours? Inspiration... Where Do You Get Yours? Art... no matter what medium... is created through individual inspiration. Sometimes we capture it through looking inward... while other times... it comes from outside influences. Where do we get our inspiration from? Does it come through the wisdom of those before us... or from hands that show years of hard work? Does it come from the innocent face of a child.... or through the playfulness of a new puppy? Do we see it in nature that has been untouched by man... or in landscapes well traveled? Do we harness it from places we have yet to go... or from beliefs that we hold close? Are we inspired by accomplishments once thought impossible to attain... from love that shows no limits... and glasses that are always half full... or from peace in the solitude we seek? Where ever the inspiration comes from - we own it - we make it ours... and mold it into something new... something for someone else to love... to be inspired by. 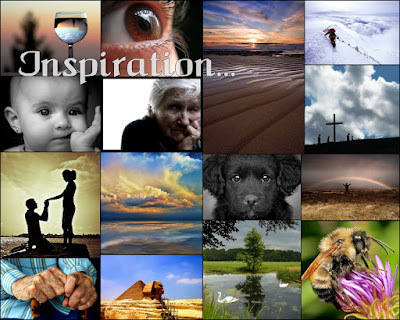 In each inspiration there is a story to tell... what is yours?